Calling all iPhone, iPad, iPod, and MacBook users—this Grommet has your name on it. No more mixing up your Apple chargers, cords, and earbuds with his, hers, or anyone else’s. Especially sized to fit any Apple product that uses earbuds, a USB dock connector, or power adapter, Buoy Tags make it easy to distinguish your precious Apple cables from those of friends, colleagues, roommates, and family members. Simply select your initials from the included sheets, insert your letters of choice, and snap the Buoy Tags into place. You can even include your contact information. The founder, Erin Strater, is a longtime Apple fan who while working in the film and television industry found herself surrounded by Apple users like herself. Instead of using markers or sticky tape to lay claim on her all-important cords and connectors, Erin decided to create a cable label featuring a sleek low-profile design to complement her devices. (Our testers were pleased to report that Buoy Tags work on many non-Apple cords as well). Great for around the house, the dorm, or the workplace, Buoy Tags are a smart, simple way to stop your accessories from getting up and walking out the door when you’re not looking. Hello all. I’m a longtime Apple user and the founder of Buoy Tags, based out of Los Angeles, CA. Buoy Tags were created out of the necessity to clearly differentiate my Apple cables and chargers from others. They are a system of lightweight labels that allow you to identify, customize and protect each of your Apple cables without interfering with normal use or damaging your cords. Attaching them is literally a snap. 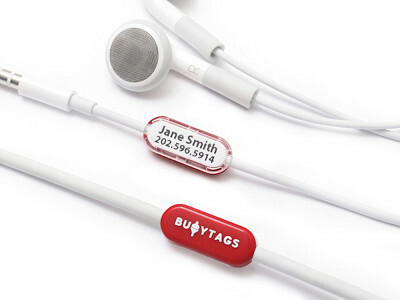 The sleek low-profile design and solid feel of Buoy Tags complement the look and feel of your Apple gear. I am happy to answer any questions you may have. @Bobbi Yep. You can snap them off the cable and use them again. Hi @Kathy. Currently, The Grommet does not offer shipping outside the United States, but yes, I do offer worldwide shipping through my company site buoytags.com. The Grommet also recommends a company called Bongo to ship internationally https://bongous.com/. How many Buoy Tags per $12? You will receive three specifically sized Buoy Tags per $12 pack. One for your earbuds, one for your iPhone or iPad charger and one for your laptop charger. If you don't need the earbud one, could you substitute for another iphone/i/paid charge? Also, is it courtesy shipping? Great concept, I think that you should expand the product to cover various size cables. That is to say, various sizes for larger diameter of cables . Thanks very much Bryan. I'd love to expand the line and have had intentions to do so. As soon as we're able to make more sizes, and even colors of Buoy Tags, we will. Incidentally, although they are designed for Apple cables, they do fit many other manufacturers cables of similar size. Ha. Yeah, I hear you. There are templates on buoytags.com. They can be downloaded in Word, Photoshop or Illustrator format—whichever you prefer. You can then type or draw anything you wish on these and cut them out for use inside the tags. However, keep in mind, that as these tags are designed for Apple cables, they may not fit any and every cable in your household. Calling all iPhone, iPad, iPod, and MacBook users—this Grommet has your name on it. No more mixing up your Apple chargers, cords, and earbuds with his, hers, or anyone else’s. Especially sized to fit any Apple product that uses earbuds, a USB dock connector, or power adapter, Buoy Tags make it easy to distinguish your precious Apple cables from those of friends, colleagues, roommates, and family members. Simply select your initials from the included sheets, insert your letters of choice, and snap the Buoy Tags into place. You can even include your contact information. 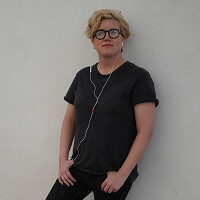 The founder, Erin Strater, is a longtime Apple fan who while working in the film and television industry found herself surrounded by Apple users like herself. Instead of using markers or sticky tape to lay claim on her all-important cords and connectors, Erin decided to create a cable label featuring a sleek low-profile design to complement her devices. (Our testers were pleased to report that Buoy Tags work on many non-Apple cords as well).